Hutchins Market in Northtown looked to be going the way of its cross-street neighbor Muddy’s Hot Cup (which for some reason the owner believes was facilitated by this newspaper… go figure). Shantaram Jones was clearly struggling making a go of it at Hutchins. And he was straightforward about it – explaining to inquirers that he was having business problems. As the months wore on, suppliers stopped making deliveries and the shelves became more and more barren. It wasn’t the result of a disappearing act by the professional magician Shantaram. However, he did find an escape in the form of Jeff Nagan. At the beginning of the month, Nagan took over ownership of Hutchins. It’s the second liquor store for Nagan and the family is building a bit of an empire (sister Johanna Nagan started running Blondies Food and Drink on LK Wood last year). And things are happening quickly at Hutchins. Sales people are coming back in and making orders with Nagan. The shelves are beginning to fill as Nagan’s reputation as a good buyer at Arcata Liquors preceded him at Hutchins. He and Arcata Liquors Manager Lee Encinias did heavy-duty cleaning and painting. That funky smell… gone. The double liquor sales will also allow Nagan better buying power as his goal is to become more competitive with chain store pricing. What’s more, he’s bringing back the Hutchins deli, a first in 15 years. Johanna at Blondies will be supplying deli items for the Hutchins cold case. “The old timers who come in say that the deli used to kill it,” Nagan relays. It’s more good news for Northtown, which is experiencing a bit of a renaissance. Even Al is back, sign in hand. Hutchins was originally a slaughterhouse with a meat counter at the neighboring Hey Juan’s before becoming a grocery store. If you ask Nagan nicely, he might show you the hooks still hanging from the ceiling. It’s more booze news at Arcata Theatre Lounge as owner Lara Cox has finally realized her dream of having a martini at the club. When Cox finally got the theater reopened following a five-year struggle, the Department of Alcohol Beverage Control liquor license for full service was just too cost prohibitive. She and Brian Cox reluctantly went for the cheaper beer and wine option. However, they bit the bullet and acquired one. Now movies and music can be viewed with margarita in hand. After talking with Alissa Sobo for a few minutes it would be difficult to not assume she’s going to take over the world. But she’s smart enough to know to start small. On Monday, the former HSU student is opening Naan Of The Above in the lot across from Internews on Seventh Street. Last week. she parked her big yellow trailer there in preparation. Finally, A-town will have Indian food. When it’s described as a trailer, it doesn’t really do Naan justice. 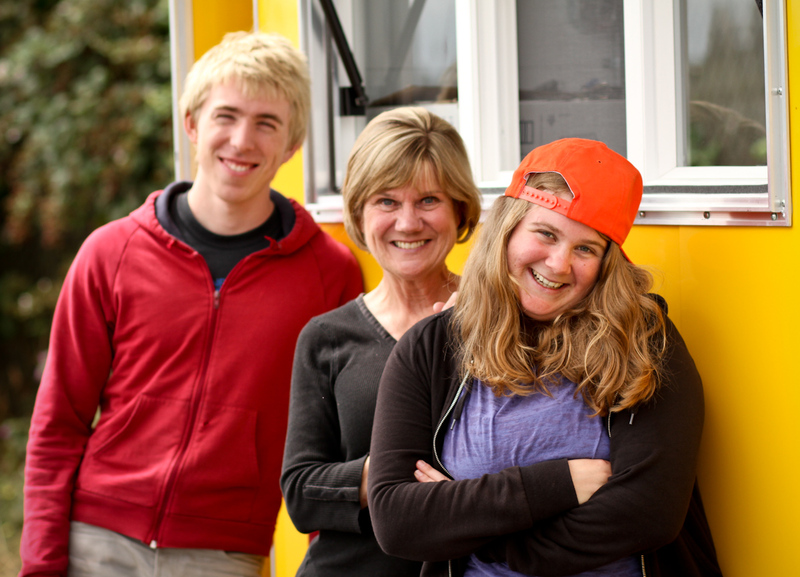 In fact, Sobo had the kitchen on wheels custom built at West Coast Trailers and laid out everything herself – down to the sunny bright yellow exterior. Inside is a chef’s palace – a stainless steel roomy galley with a three-cabinet sink. “Even the health inspector loved it,” Sobo said. Sobo is a white girl from San Diego. She doesn’t have a drop of South East Indian blood in her body. She knows this. “I’m not going to be out here in a sari or anything,” she says. For Sobo, she’s just passionate about specifically Indian regional cuisine. And the chemistry major has been working in her own lab – her kitchen – for the past several years perfecting it: baked to order naan bread, mango lassi, basmati rice, potato samosa, Masala chai tea and more. And she is adamant about diners being provided meals in formal ceramic bowls. “Your food will be hot,” she promises. The lot will have four tables and 14 chairs and Sobo is planning to maximize the ambiance potential. Music is a must, she figures. Her second passion is dancing and Sobo is threatening to create Friday night dance parties. Backing her up are mom and dad. Lee and Barbara moved from San Diego to join their daughter on the journey. “I’m clearly young and I am young-looking. At times there is some skepticism” Sobo said that having her distinguished folks and their life experience in finance and bookkeeping and permitting can come in handy from time to time. Addendum: Alissa was overwhelmed with business on her first day last Monday, and literally ran out of curry. She’s ordered more equipment to streamline the process and get everyone served in a timely fashion, and plans to re-open Tuesday, Sept. 7. Check naanoftheabove.com for updates. This entry was posted on Wednesday, September 1st, 2010 at 1:32 pm	and is filed under Community, Business. You can follow any responses to this entry through the RSS 2.0 feed.